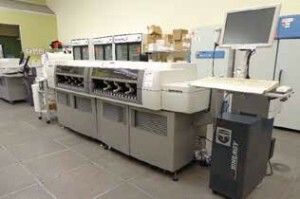 2011 Abbot Laboratories “Architect Plus ci4000” Integrated Immunoassay and Chemistry Testing Machine s/n C400815 w/ mdl. I1000SR Integrated Module s/n i1SR51216, Elix Millipore 15 Water Filtration Unit s/n F2CA89169D. 2010 AB Applied Biosystems “ViiA7” Real Time PRC Genetic Analysis System s/n 278881029 w/ Twister II 3-Rack Robotic Loading System. Agilent “Bravo” mdl. 16050-101 Automated Liquid Handling Platform s/n SGS10BLH13501 w/ Nine Deck Positions, 384ST and 96ST Interchangeable Pipette Heads. (2)MSD “Sector Imager 6000” mdl. 1200 Biomarker Based Electrochemiluminescence and Surface Pattern Imagers s/n’s 1200101102616, 1200081016489. ForteBIO “Octet QK” Kinetic Data Analysis and Real Time Quantitation of Kinetic Characterization of Biomolecular Interactions System s/n FB-00210. Agilent “2100 Bio Analyzer” High Sensitivity DNA and RNA Molecular Assay Analyzer s/n DE54704442. Ion Torrent “Ion One Touch System” w/ Ion One Touch ES and Ion Touch 2 Automated Template Prep for Ion PGB Sequencer s/n 2456393-2008 and 392665. Sage Science Pippin Prep DNA Size Selection System. 2010 Sysmex Corp. mdl. XT-2000i Automated Hematology Analyzer s/n 15951. 2011 Instrumentation Laboratories mdl. ACL TOP CTS 500 Coagulation Analyzer s/n 11081904. Auto-Genomics “Infinity Analyzer” Automated Molecular Platform Analyzer s/n 10041214. Thermo Scientific “Nano Drop 1000” Spectrophotometer s/n F518. (2)Quansys Biosciences “Q-View Imager” Chemiluminescent Array Imagers s/n’s 115849, . Bio-Rad “Benchmark Plus” Microplate Spectrophotometer s/n 10601. Beckman Coulter Z2 Coulter Particle Counter and Size Analyzer s/n AL11060. (6)Bio-Rad / Luminex “Bio-Plex 200” Multiplex Array System Analyzer s/n’s LX10008316402, LX10008122405, LX10007316408, LX10007306406, LX10007020402, LX10007176403. Bio-Rad mdl. PR4100 Absorbance Microplate Reader s/n 1112001942. Bayer Health Care “Clinitek 5000” Urinalysis Analyzer s/m 13B1X00096. Bioruptor mdl. UCD-200 Bench Top Sonication Device w/ Diagenode SA Sound Proof Enclosure. Life Technologies Invitrogen Qubit 2.0 Fluorometer. 2011 Labconco “Protector Laboratory Hood” mdl. 7280100 Chemical Fume Hood s/n 110135883G. 2012 Thermo Scientific “HERA Therm” mdl. IMH180 105 Deg C. Incubator s/n 41391183 (New). 2012 Thermo Scientific “HERA Cell 240i” CO2 Incubator s/n 41400310 55 Deg C to 90 Deg C (New). (2)Thermo Electron Corp “Forma -86 Deg C ULT Freezers s/n’s 807971-353, 810509-546. Thermo Scientific “Revco” mdl. REL4504A22 Freezer s/n 0117654901101207. (2)Thermo Scientific “Revco” mdl. REL2304A22 Freezers s/n’s 0117579601101027, 0117579501101027. Fisher Scientific “Isotemp” mdl. MR72PA-GAEE-FS Commercial Refrigerator/Freezer s/n 0146992501121102. Fisher Scientific “Isotemp Plus” mdl. 13-986-125 Commercial Refrigerator/Freezer s/n 0168379501110603. (2)Thermo Scientific “Revco” mdl. REL4504A23 Double Glass Door Refrigerators s/n’s 0116913901120629, 0116913801120629. Thermo Scientific “Revco” mdl. REL4504A22 Double Glass Door Freezer s/n 0117664301101209. (3)VWR mdl. GDM-42 Double Glass Door Refrigerators s/n’s 5053039, 5053038, 4992172. Fisher Scientific “Isotemp” mdl. MR05PA-SEEE-FS19 Laboratory Refrigerator s/n 0112088101120913. Scotsman mdl. AFE424A-1A Ice Maker. Labconco Refrigerated CentriVAP Centrifugal Concentrator s/n 110644199E w/ Welch “2044 Dry Fast” Drying Vacuum Pump. Thermo Scientific “IEC Centra W” mdl. 80300569 Cell Washing Centrifuge. Eppendorf mdl. 5810-R Refrigerated Centrifuge. (2)Eppendorf mdl. 5804-R Refrigerated Centrifuges. Thermo Scientific mdl. CL2 Centrifuge. Clay Adams “Sero-Fuge 2001” Centrifuge. (6)LW Scientific mdl. E8 Centrifuges. (6)Horizon mdl. 643 Horizontal Separation Centrifuges. Pelton & Crane “Validator 10” mdl. HA Autoclave s/n AA-07602. VWR mdl. SB 80 PC pH/Conductivity Meter. (3)Tecan HydroFlex Plate Washers s/n’s805006486, 805006058, 805006057. BioTek mdl. ELx405 Auto Plate Washer. BioTek mdl. 405/LS Microplate Washer s/n 1305224. Bio-Rad mdl. PW-41 Mini Lab Plate Washer s/n KCIC413503R. Biomerieux “Vitek 2 “ Smart Carrier Station. Bayer Health Care mdl. 4488C Hematek Slide Stainer s/n 44488C201109. Millipore “Simplicity System” Water Purification System. Thermo Scientific mdl. 2002 Multi-Block Heater. (2)Fisher Scientific Digital Vortex Mixers. (2)IKA MTS 2/4 D S1 Mixers. (2)Fisher Scientific 260100F Nutating Mixers. (2)Branson mdl. 1510 Ultrasonic Cleaning Tanks. Mettler Toledo mdl. AB135-S Digital Lab Scale. Ohaus “Adventurer-SL Digital Lab Scale. (51)Work Place Portable Lab Benches. Large Quantities of Disposable Lab Products. (2)PolyCom “Sound Station 2” Conference Call Systems. (27)HP Laserjet Color Copiers and Printers. (10)Zebra TLP2824Plus and S4M Label Printers.